The July PADI Instructor Development Course (IDC) Candidates are taking their lessons day by day and they are doing an awesome job! 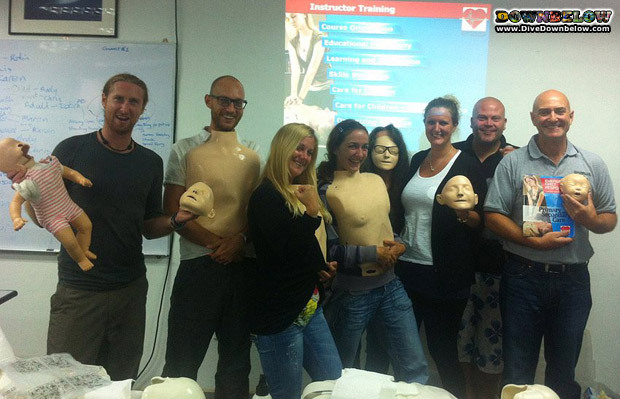 A few days ago they completed the Emergency First Response Instructor (EFRI) Course at Downbelow’s head office in KK Times Square Kota Kinabalu Sabah. As with the other classes, everybody had fun while developing their instructional abilities to teach the skills to others. The course covers specific goals and performance requirements for the Primary Care, Secondary Care and Care for Children courses, along with instruction on how to structure learning, the requirements of performance-based training, and the role of the instructor in the learning environment. Apart from that, the course also teaches the candidates how to motivate students, evaluate student knowledge, present course content effectively, become proficient in developing students’ hands-on skills practice sessions, and are taught how to present an effective scenario-based learning experience. While on the subject, if you would like to learn and be ready for any emergency situation, consider attending our PADI Emergency First Response (EFR) Course. It is a dry course and no prior qualification is required. Find out more or contact us for details.